As I've mentioned in another question, I'm attempting to make a large block of gelatin. Unfortunately, my first few attempts come out a bit amber in hue, using just water, sugar, gelatin and clear flavoring. In looking at their images, I think that there's still a little hue to their solution, but I'm not sure which of the differences are most significant to the process. Does anyone know? You need to pour the gelatin while it's quite hot. 170°F (77°C) was fine, but even taking it down to 160°F (71°C) resulted in a good bit of murkiness (likely introduced by small air bubbles when pouring; I might have had better luck with more careful pours, or using alternate means to move the liquid (eg, syringe)). You need to minimize any air bubbles. If you pour it in layers, slowly move a fork through the top to pop and bubbles. If you still have a few remaining after it's set, you can pour the hot liquid on the bubbles to remove them from that layer. (I used a spoon to deflect the pour to right near the wall of the container). Avoid flavorings. Alcohol-based extracts will make it more murky. (it clears up some after heating; it's absolutely horrible if you try mixing it in at the end) Oil based flavorings had no emulsifier, and would just separate out. (the best flavoring I could find was 'white cranberry' beverage (10% juice), but noticed there seemed to be variance over time in the color. (a bottle that I had in storage for a year was considerably more apple-juice like in color than a more recent purchase). 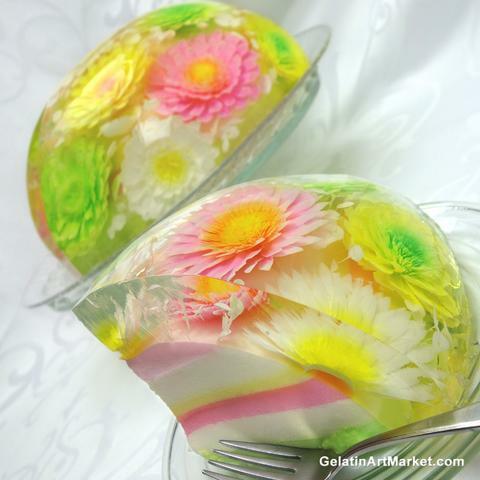 Gelatin has better visibilty than Agar-Agar. Although Gelatin has a tint, the Agar isn't fully transparent when it sets, even after holding it for hours at temperatures just off the boil. (I was using an immersion circulator for heating, so I never took it to a full boil. Held it at 95°C (203°F) overnight, then tried a couple of hours at 99°C (210°F). no matter what you do, you can't set licorice laces in arches in jello. 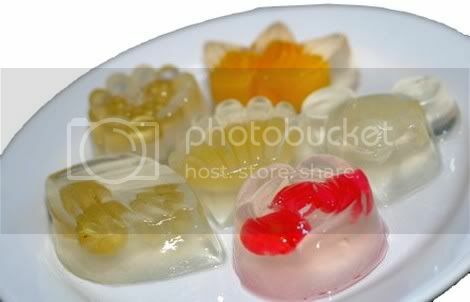 The heat needed from the pour causes them to collapse, even if you freeze them first, or set them in a layer of jello. (tried Agar too, but I had to mix it fairly week to keep it from being too opaque and it didn't set up enough to hold vertical; this might be related to my holding it at high temps for too long, though). I never tested if citric acid had an affect, but I just don't think that I can pull off what I'm looking for in this scale. After 3 more catastrophic failures this year (on top of the 2 last year), I think I'm giving up on this project. The gelatine is made either beef or pork. The beef is the yellow grains the pork is what you want for transparent it is a white grain. It took a lot of research to find this simple answer. Gelatin in photography is never subjected to boiling temp as it loses its viscosity temps to melt - low bloom and high bloom gels are also different. Cowhide gels are for photographic emulsions. Porcine (pig) gels are the clearest. The first extraction from a batch cow or pig is the highest bloom. Different temp and acids and another run leads to lower bloom. Blooms as low as 75; will melt on your kitchen table. A dissolved 300 bloom will melt at about 113. Porcine is used for clear gelatin capsules therefore you need a high bloom pig. Agar agar you buy at Asian markets. It's shipped from Los Angeles to el, and in between. New York good price. 4/5 sticks in a clear package color clear, red and green sticks. Cut up to small pieces, just cover with water soak overnight. Get a slow cooker from Goodwill and bring solution up to medium heat or highest. A pan on a stove is not good. Don't burn or scorch; check just for a slight boil. Agar can be left heating until water is half gone. This is no problem, simply add more water. When finished, cover crock without free cloth no lid or condensation will fall back on agar. Set in refrigerator not freezer 45 to 70 will last a year. Take out let rise to room temp them use crock again. I use both in my darkroom for making sub bases to hold gelatin on glass plates and negative and positive emulsions. You can read lots of info but exact procedures to work the magic is lacking in basic information. Psyllium husk as gelatin replacement.